The estimate of climate finance was prepared at the request of the Peruvian and French governments in the context of their responsibilities as the presidencies of the UNFCCC Conference of Parties (COP). Climate finance flows are an important element of the negotiations in the lead up to COP21 in Paris, where countries are expected to finalise a new universal agreement on responses to climate change beyond 2020. This OECD report, in collaboration with Climate Policy Initiative, provides an up-to-date estimate of public and private climate finance mobilised by developed countries towards their UNFCCC 2010 Cancun commitment, for climate action in developing countries. Public and private finance mobilised were estimated at USD 62 billion in 2014, up from USD 52 billion in 2013 and making an average of USD 57 billion annually over the 2013-14 period. 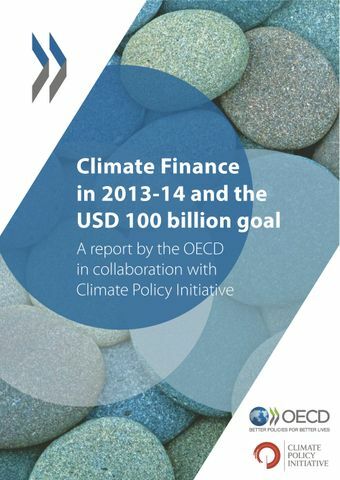 Released in advance of COP21 to increase transparency about progress towards the USD 100 billion goal, the report builds on other recent international efforts to improve the tracking of climate finance, including by the UNFCCC Standing Committee on Finance. The lessons learned from conducting this exercise may be helpful in informing efforts to further improve the transparency and comprehensiveness of climate finance measuring, tracking and reporting. These estimates comprise public finance provided by donor governments through various instruments and institutions, including non-concessional loans. It also includes private funding for climate-related projects that has been directly mobilised by developed country public financial interventions. There is an acknowledgement of the important role played by capacity building and policy related interventions as well as enabling environments, although it is an outstanding challenge to account for these in quantitative terms. Why the OECD and CPI? The OECD has extensive experience and expertise in tracking and measuring climate-related development finance, both through the OECD Development Assistance Committee (DAC) statistical framework and the OECD-hosted Research Collaborative on Tracking Private Climate Finance. Climate Policy Initiative brings substantial knowledge on the overall landscape on climate finance, and since 2011 has worked at the forefront of efforts to systematically track global climate finance, and to address related methodological and definitional issues.